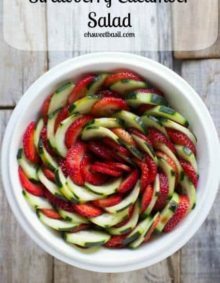 Last year we celebrated our Grandpa’s 90th birthday and everyone raved over this classic Southern Grape Salad with Pecans recipe. It’s creamy and crunchy! I really cannot even begin to tell you how delicious this Southern Grape Salad with Pecans is. There’s practically nothing to it, and yet you can’t stop, in fact, won’t stop eating it. 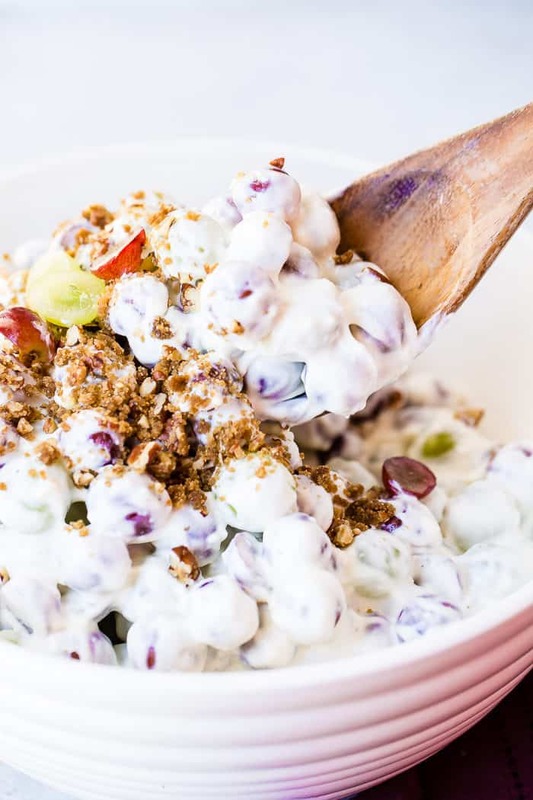 A creamy yogurt and cream cheese dressing over bright, juicy green and purple grapes and topped off with a crunchy brown sugar pecan topping, I mean what more could you want in a potluck side dish or bbq salad?! We went to a big family reunion last summer and this Southern Grape Salad with Pecans showed up. I was like, looks like we are staying for another hour, kids! I did not grow up eating this salad and while Cade probably did, he says he doesn’t remember it but won’t ever forget it now. The “dressing” is very simple, cream cheese, yogurt, powdered sugar and vanilla. It’s not thick, so don’t worry about that cream cheese in there and yes, add the vanilla, it changes everything. On top you’re going to sprinkle on brown sugar pecans. It’s the same recipe for the nuts we put on top of the famous Berry Salad with Lemon Dressing, but using pecans instead and I’m telling you, it’s gold. I double the top because, well why wouldn’t you. I’ve never understood why things are put in a bowl with toppings because then whoever gets the last scoop doesn’t get any. This way you ensure that everyone gets some. In fact, I’ve started serving it in a flatter platter (that rhymes!) so that I can evenly sprinkle the topping. And yes, you could use a different nut, but I have to admit, pecans are the best flavor for the grapes. No, I don’t know why, but it’s true. What Grapes do you Put in Grape Salad? Now every recipe differs a bit, some are all green, some all red, but I’ve found that I’m either all red grapes (whoever named red grapes and red onions is clearly color blind, I’m just sayin’) or preferably a combination of red and green grapes. There’s no real reason other than I love the color, and I feel like the reds are a little sweeter. Are Red and Green Grapes Different? Red grapes do tend to be a little sweeter than green grapes. Red grapes have more antioxidants. The difference in color between green and red grapes is caused by anthocyanin in one gene of the grapes. A mutation in green grapes causes anthocyanin to not be produced, so the grapes stay green. Because of the lack of anthocyanin, green grapes don’t have as high of antioxidants as red grapes. Researchers believe that many components of red grapes can protect from breast, lung and colon cancer, but don’t take that as perfect fact. In the end, the differences are actually so minimal it ends up being up to you and your preferences. Pick you like. This is a way easier salad to eat if you slice the grapes, but cutting that many grapes is a real beast. It’s too much time and effort, so 99% of the time I haven’t done it this summer, but if you are going to, here’s how to slice grapes quickly. It’s the exact same as slicing grape tomatoes, so follow our post on The Easiest and Quickest Way to Slice Tomatoes for that one. What Goes on Top of Grape Salad? 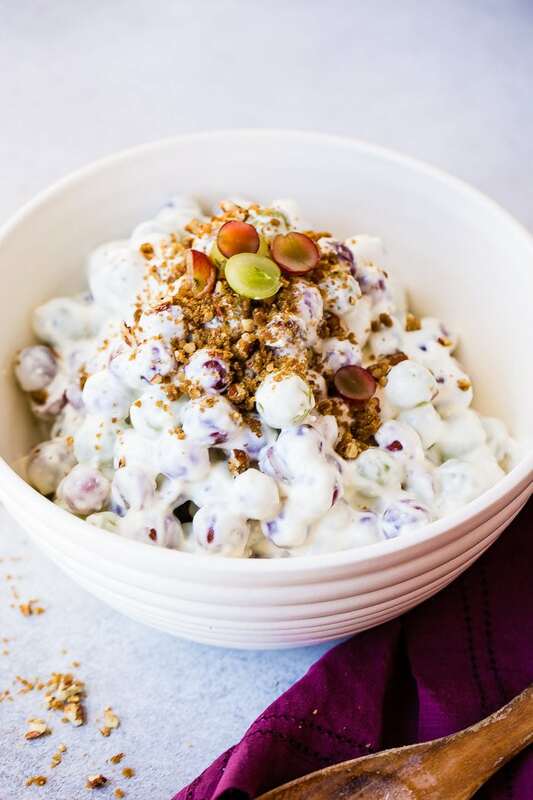 Grape salad typically has a nut topping with a little brown sugar. I’ve seen a couple of recipes that use a brown sugar oat topping which I’m really excited to try out in the future. Different recipes make the topping in different ways, but our recipe is a brown sugar nut meaning that the nuts are toasted, butter is added to the pan along with brown sugar and cinnamon and everything is cooked just for a couple of minutes then quickly turned out onto a piece of parchment paper or a cookie sheet to cool. Being cooled completely is essential as we don’t want the cream cheese and yogurt dressing to get warm and separate at all. What nut is best for grape salad? We’ve tested out almonds, pecans, cashews and walnuts. Walnuts had a little too robust of flavor for the salad while cashews were too buttery. While almonds were great in a pinch, they were too hard when not sliced and too thin and brittle when they were sliced, so pecans really ended up being the winner when chopped fine. Is Grape Salad a Dessert? 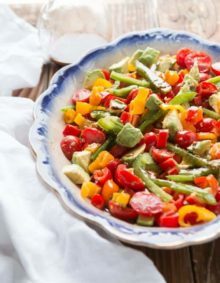 We consider grape salad to be a side dish, but looking at the ingredients it could totally go either way, in my opinion. How Long is Grape Salad Good For? Grape salad will last longer if you store the topping separate from the grape salad. The nuts will soften a little if you store it all together, but it’s still totally edible and delicious. Grape salad can be stored in the refrigerator in a sealed container or with plastic wrap over the food for up to 3 days at which time the grapes will begin to soften. To make a grape salad with cream cheese, start by allowing the cream cheese to sit out for about 15 minutes to soften. Being soft and not cold is key to the success of this dish as otherwise, there will be lumps. Beat the cream cheese with a handheld mixture to smooth it out and then proceed on with the recipe. Our recipe calls for both cream cheese and yogurt, while others call for one or the other. 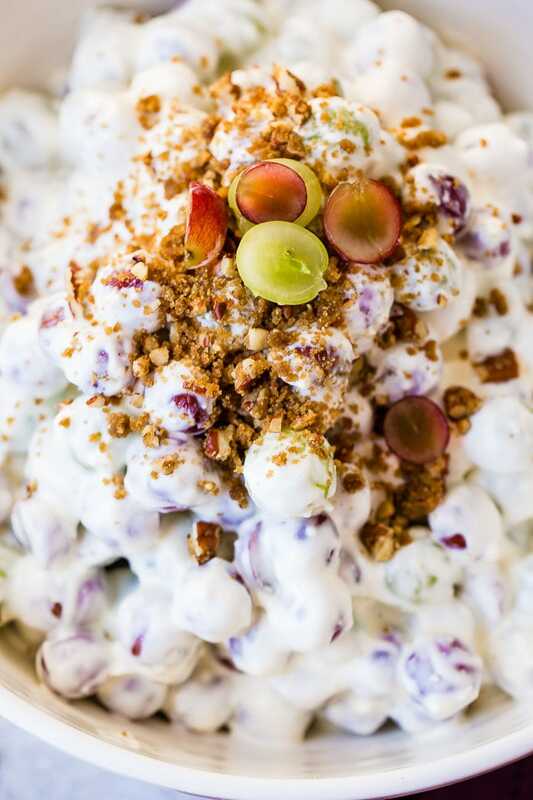 To make grape salad with yogurt, begin by softening and beating the cream cheese until smooth. Add in the remaining ingredients, except the yogurt and beat until smooth. Now fold in the yogurt and then gently fold in the grapes. 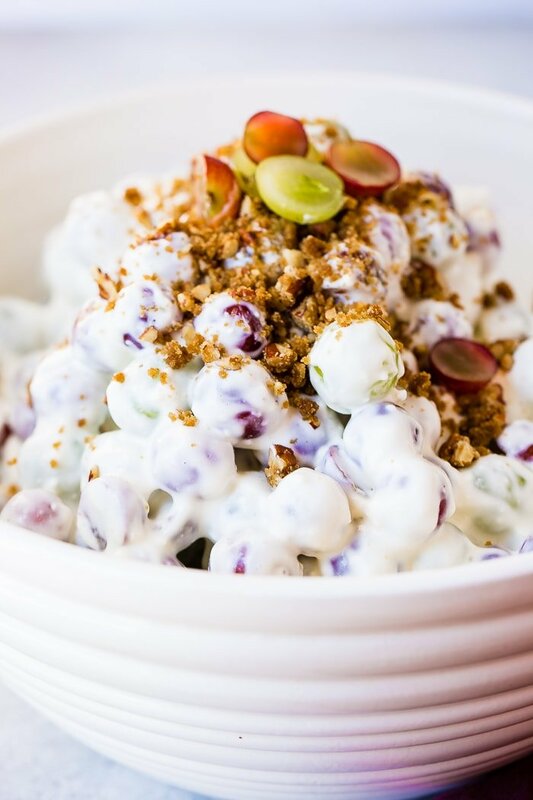 You’ve heard how we make a Southern Grape Salad with Pecans, but have you heard about butterfingers in grape salad? 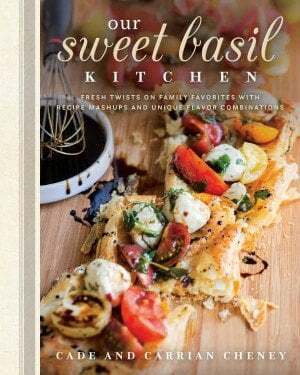 I’ve been hearing more and more people mention something about a grape salad recipe with butterfingers, and I would love to get my hands on a recipe, so if any of you have any, please let us know! Last year we celebrated our Grandpa's 90th birthday and everyone raved over this classic Southern Grape Salad with Pecans recipe. 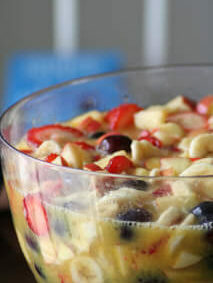 It's creamy, crunchy and a fresh fruit salad! In a large bowl, beat the cream cheese with a hand mixer until smooth. Add the sugar, vanilla and sour cream and beat until smooth again. Scrape down the sides of the bowl, add the yogurt and fold until well incorporated. If you want grapes whole, go ahead and add them, otherwise slice them in half and then fold in. Place everything in a bowl or serving platter and top with brown sugar pecans right before serving. Add the chopped pecans and stir occasionally until fragrant, about 1 minute. Quickly add the butter and begin to melt it, then add the brown sugar and cinnamon, stirring quickly to coat. Once the brown sugar is starting to stick to the nuts, about 30 seconds, pour out onto a parchment paper to cool. Hey Guys, have you tried using Cotton Candy Grapes instead of green or red? They really taste like cotton candy. We haven’t, but that is a great idea! The recipe just calls for sugar, but in the directions, for step 2, it states “add the powdered sugar.” Is it granulated sugar, or powdered sugar? Can you please clarify? Thanks! It looks delicious, and I cannot wait to give it a try. That’s good to know!! 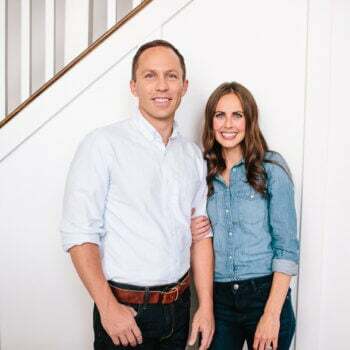 And thank you!